Feline asthma, sometimes referred to as allergic bronchitis, is very similar to the asthma we humans get. Asthma is an allergic reaction that causes spasms in the airway. These spasms can lead to swelling and difficulty in breathing. For some cats, this can be a chronic problem, while for others it can be seasonal or can come and go inexplicably. In some instances, once a cat’s airway is restricted, your cat’s ability to breath can become life-threatening in just minutes. 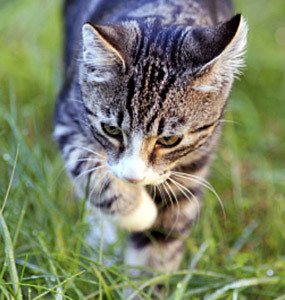 Cats of all ages and breeds can be affected by asthma. It can be triggered by stress or simply by the environment the cat lives in. Cats experiencing an asthma attack can show very few signs of distress, and sometimes the signs are not obvious. If you suspect your pet has asthma, you should contact your veterinarian immediately. They will conduct a physical examination and review your cat’s history. They may recommend tests to help identify why your cat is showing signs of asthma, and to see if asthma is really the underlying cause. Whether your cat’s asthma is a sudden condition or chronic, it cannot be completely cured. Fortunately, cats with asthma often do very well with appropriate treatment. Since asthma is usually caused by an allergic reaction, identifying and removing the allergen (if possible) may help to reduce or prevent future problems. However, some asthma attacks are brought on by other conditions, such as stress, so focusing on alleviating stress can also help, as well. The best way to prevent asthma attacks is to work with your veterinarian to identify what the right plan is for your best friend.